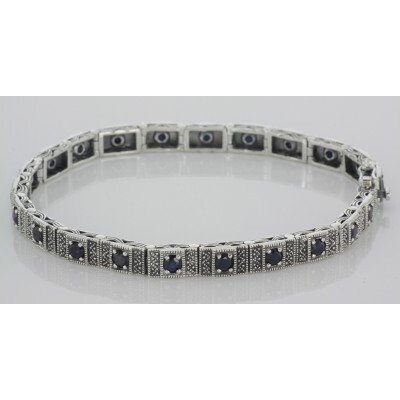 Victorian Style Natural Sapphire Filigree Link Bracelet. 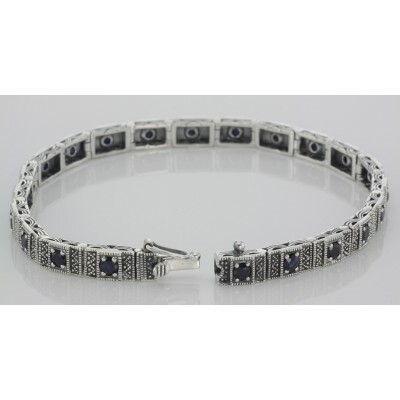 This beautiful link bracelet features a genuine natural blue sapphire gemstones mounted in the center of each of the 22 filigree links for a total of over 2 1/2 carats of Sapphires. Sapphire is the birthstone for the month of September. 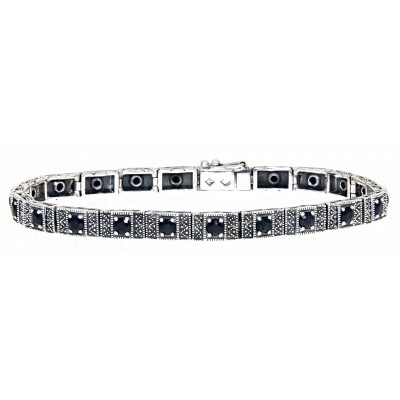 This bracelet is timeless in style, can be enjoyed, cherished and handed down as a precious family heirloom. This lovely antique victorian style bracelet would make a perfect gift for many occasions. This bracelet is new and a high quality sterling silver antique and collectible reproduction and comes with a money back guarantee. Please see our nice selection of fine Antique / Art Deco and Victorian style filigree jewelry.